Working with Willow I make baskets in the English Tradition (underfoot bases) as well as frame baskets. I also sculpt using willow and make garden products, obelisks, plant supports and hurdles (fencing). I like working with community groups and have undertaken some living willow structures both planting and maintenance. I teach some adult classes using willow in the garden, making willow creatures and making hoop and rib baskets. 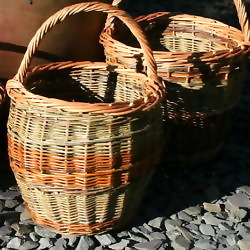 English Traditional Baskets. Sculpture. Willow in the Garden.